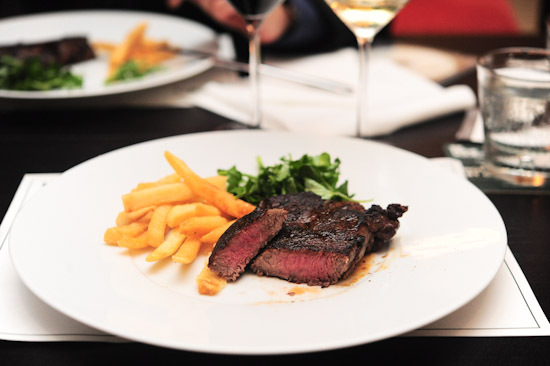 Located in the lush Dempsy Hill area, The Prime Society is a steak restaurant in Singapore that specialises in prime quality meats. With its indoor and alfresco dining, the restaurant can easily accommodate up to 150 guests, and they also have a bar where you can enjoy your pre-dinner drinks. Previously from Flutes at the Fort restaurant, Chef Rollinson took over The Prime Society’s kitchen earlier this year and he was quick to make his mark on the menu. We were at The Prime Society to try his new set lunch menu ($28++ for 2 courses, $33++ for 3 courses). It includes choices like Seared Foie Gras/Beef Carpaccio for appetisers, and Grilled NZ King Salmon/Wagyu Bolognaise/Black Sirloin for main courses. The Beef Carpaccio was almost too handsome to eat, but I eventually finished everything of course. This is only available as an entrée for Prime Society’s set lunch. The Prime Society managed to strike the right balance with the Hokkiado Scallops. Without being overpowering, the rich and creamy sauce was the perfect companion for the plump and meaty scallops. Yummy! Unfortunately, the Grilled Wagyu Rump for that night was somewhat disappointing – we felt that it was slightly overcooked. Whilst the steak still managed to retain a pinkish tinge in the middle, it was a little too tough; losing the tenderness and flavour of the prized cut. Given that The Prime Society is known as one of the best steak houses in Singapore, it was an anticlimax to the otherwise excellent dinner. Luckily, the excellent Dark Valrhona Chocolate Bar (only available during lunch) saved the day. Instead of serving it with vanilla ice cream, the chef chose to pair coconut sorbet with the dark chocolate bar. The result? I was licking my spoon for every bite of the chocolate and sorbet. Most of the appetisers on the ala carte menu of The Prime Society Restaurant are priced below $20, with the steaks ranging from $44 (220g Grass Fed Rib Eye) to $72 (450g Grain Finished from Queensland). I know it is strange to say this in a steakhouse, but if beef is not your favourite meat, they have other mains like the Western Australian Pork Belly ($40), Spatchcock Chicken ($38) and fish on the menu. With the exception of the steak, the other dishes that we had were pretty good. I think I will give The Prime Society another chance and come back again for their Sirloin, Wagyu Beef Burger and Prime Society Ribs. Which is your favourite Steak Restaurant in Singapore? Small tables and food was disappointing, I pushed the boat out and ordered the wagu ribeye (special of the day) it arrived at thentable cold, the truffle butter didn’t even melt, had to send back and they reheated it again, this obviously changed steak from medium to medium well. I complained to the waiter who agreed and he added that after 10 years of working at Mortons the kitchen staff at here was clueless, nothing was done to correct the situation, my advice is spend the extra and go to Mortons, they know how to cook a steak and you will have a great night! Absolutely not worth the price…. I just step out of the restaurant. I concur that the beef were over cooked on the outside and for a declare STEAK HOUSE it is not of good standard. Moreover, poor service as no waiter/waitress top up water and check on my request for birthday surprise for my friend which I informed the manager earlier before my friend arrives. Will never go again. Not many customers but poor service. Moreover, I feel so embarrassed to have my birthday friend wiping her sweating face as there’s no aircon and proper air ventilation in the restaurant. There are definitely better places with the price I paid. Regret going there!